cultivate individual and institutional initiatives to improve ethical climate and infrastructure. 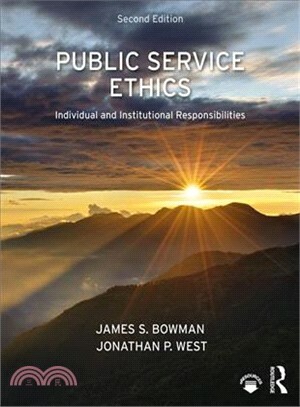 Authors James Bowman and Jonathan West capture reader interest by featuring learning objectives, skill-building material, discussion questions, and exercises in each chapter. The authors’ narrative is user-friendly and accessible, highlighting dilemmas and challenging readers to "own" the book by annotating the pages with one’s own ideas and insights, then interacting with others in a live or virtual classroom to stretch one’s thinking about the management of ethics and ethics of management. The ultimate goal is to bolster students’ confidence and prepare them for the ethical problems they will face in the future, equipping them with the conceptual frameworks and context to approach thorny questions and behave ethically. James S. Bowman is professor of public administration at the Askew School of Public Administration and Policy, Florida State University, USA. Jonathan P. West is professor and chair of political science and director of the graduate public administration program at the University of Miami, USA.